We live in difficult times at the moment and there are many that are suffering, not just as a result of Friday’s attacks in Paris but as a result of what is happening every day somewhere in the world. So what can we do that might make a difference, that might help healing, not just on a personal or local level, but on a world level? I don’t pretend to know the answer but I do know it is not by retaliating, by being angry nor by being afraid for fear feeds fear. I also know that on an individual level what we feel we can do, or feel able to do, can seem very small. If though we stop seeing ourselves as individuals and see ourselves as part of a world wide collective we may find we are very powerful indeed, or at least a lot more powerful than we are on our own. This weekend I attended a workshop and as part of the day we mediated, not on the world situation but on raising our awareness, our consciousness to the highest level possible at that time on that day. In that state of expanded consciousness we sent out our intentions, many of which were connected with, if not the actual words, certainly the sense of peace and love. This felt incredibly powerful and when we drew back into our bodies left us feeling almost stunned by the power of it, of the peace we felt within us and of the space we had been in. Today I received a request via a group I belong to, a request that we join together at 10 pm tonight (Monday 16th) to send Reiki to the world. Another group is organising a day of distance healing for next weekend, others I know of are taking time out of their lives to sit and send healing or healing prayers, or to light candles all in the name of peace for everywhere in the world, for mankind as a whole. And so it starts, and so may the momentum, the desire for peace be spread. I can still remember being on a course as few years ago and admitting that I found being grateful difficult. It’s not the being grateful as such because when I stop and think about it I am grateful for so much, it’s more that I forget to be grateful on a moment by moment or even a day by day basis, if that makes sense. The last couple of days though I have been very conscious of being grateful. Recently I have made a decision to cut down, at least for the rest of this year, on how often I am available to see clients. I am grateful for having the freedom and flexibility to be able to make this decision. I am grateful for having such a rich and varied life that I need to make this decision in the first place and I am grateful that I have reached a place in my life where I know it is ok to take a step back sometimes, that I don’t feel guilty for saying ‘no’. Today I felt gratitude in quite a different way when I awoke to rain and wind, something that could have made me feel quite the opposite. After being aware that things, on the surface anyway, had been stagnant, or stationary at least, for sometime, the wind felt as if it was here to blow away the stagnancy and herald the start of a change. Just as when I open all the windows to clear the energy of my home so it seemed as if the wind was blowing my cobwebs away. By the time I was up it had stopped raining and deciding I needed some fresh air, to be outside in the wind, I collected up a basket and ventured down the garden to collect up windfall branches to dry out for kindling for the fire. Outside I realised I was not only grateful for the wind but also for the trees who were providing the kindling for us over the winter. I then realised how grateful I was for the mildness of the day which meant that in the second week of November I could be outside barefoot and not be cold. No doubt I have missed other reasons to be grateful during this time but for me this feels like as abundance of gratitude, and for that I am also grateful. Its a while since I have shared a book review here but having just finished reading this book and enjoying it I decided it was well worth telling you about it. 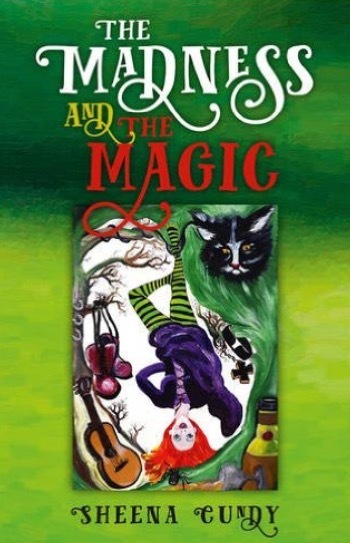 Take one witch, a few spells with some dodgy ingredients, an unusual best friend, a pack of tarot cards, a daughter facing a life changing experience and of course the new dishy local vicar, add a lot of magic, stir and see what happens. The Madness and the Magic is a lighthearted, well paced, fun read which will brighten any rainy day. Ms Cundy weaves the tarot, a little paganism and a touch of romance into this her first novel. The book ended leaving me wanting more so I do hope that the sequel is already if not on paper, at least in her mind. I know it’s November because I put the dried fruit for the Christmas Cake in soak yesterday 🙂 I do this every year and my cake is always yummy. The first year I lived in Ireland, with a great deli to shop in I bought fresh fruit for the cake and because the fruit was so moist it didn’t soak up the alcohol and the cake wasn’t half as good. Lesson learnt. Anyway, I didn’t really aim to be writing about my Christmas Cake, more the fact that I without it I would have trouble believing it’s November. The sky is blue and the sun is shining plus it’s really mild. All the windows are open and despite the leaves on the ground the garden is looking very green still. I kind of missed October completely as I was away in Japan. There the weather was also amazingly warm and sunny although it didn’t stop the leaves of the maple trees turning the most wonderful shades of orange and red. 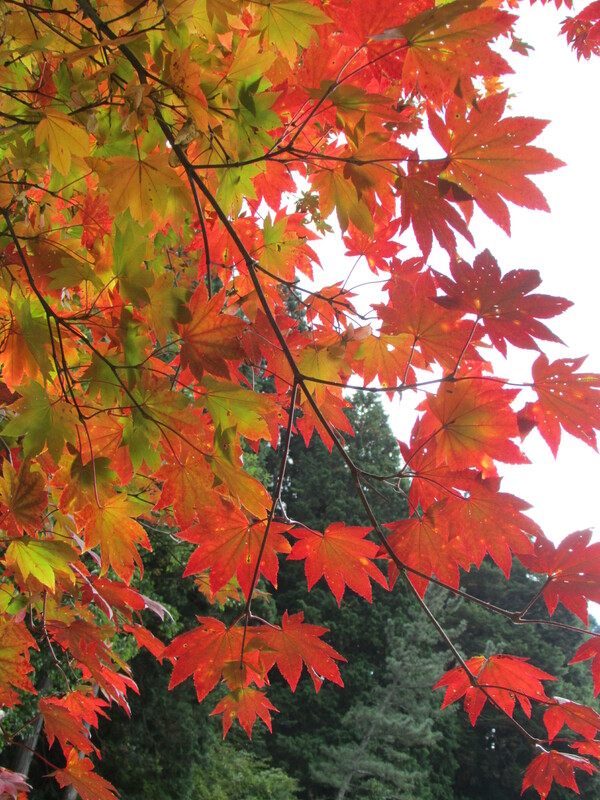 Despite being keen to plant native plants wherever possible I am now looking at getting a Japanese Maple for the garden especially as I know they grow here as there is a beautiful specimens outside a cafe in town. Before I went to Japan nature had gifted me some oak saplings. These I carefully planted in tubs but before long most of them were looking unwell and now they are just twigs 😦 I do though have one healthy sapling, which after all is all I really need 🙂 This I know will also lose it’s leaves soon, appearing to die so that it can rest and gather its strength for the spring when it hopefully bursts into bud once again. Normally by now I would also be thinking about gathering things in, shutting down a little, starting to conserve my energy and preparing for the winter so that I am in tune with the seasons. It is after all the start of the New Year being the time after Samhain, the time when things are still, where we enter the dark time, the time where seeds are sown and nurtured ready for the Spring, but with the weather the way it is it is hard to believe that it is time to do this yet. I have actually been shut down for a couple of months now, hibernating, recharging and reflecting. This process isn’t finished yet but I am aware that change is afoot. On a personal level it feels more like stepping into Spring already so for the next while I am going to be watching for signs and symbols, messages from both ordinary and non ordinary reality to help me understand what it is that I need to do now.